This item has been discontinued... but we replaced it with a better one! Check out Case Power here. 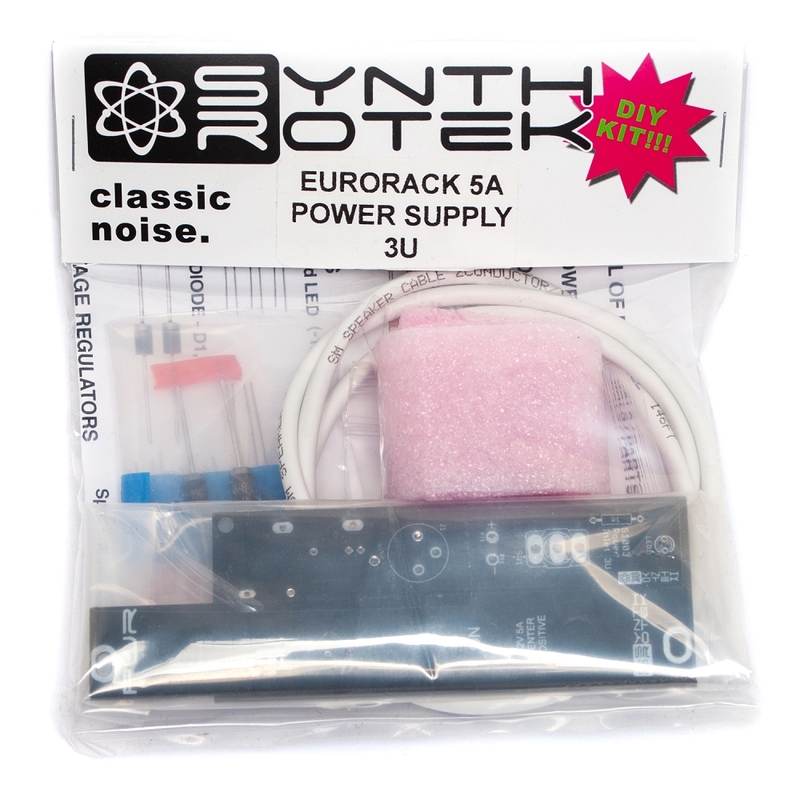 Synthrotek's "super-slim" Eurorack Power Supply System is designed to give you maximum power in a small, elegant package. This product boasts more than twice as much power as other similarly priced products! The option of 3U at 4 HP or 1U at 6 HP power entry panels makes this system easy to integrate into any professional or DIY case. For maximum flexibility, this power supply kicks out all 3 rails (-12, +12, +5) with adequate power for a medium-sized case. There are 4 mounting holes on the perimeter of the PC board. Ideal for 3X84HP and beyond (make sure to consult the owner's manuals of your modules in order to make sure you are not trying to pull more amps than are available with this power supply). 12V 5A power supply required to operate this product (can be purchased as an option above). If you purchase a brick from Synthrotek, it will come with a locking DC extension cable. Comes with 2 feet of both red and black 16-gauge stranded hookup wire (more can be purchased if needed as an option above). This is also available as a completed unit below. Certified to UL 60950-1, CAN/CSA-C22.2 No. - Using an incorrect power supply will void any warranty on this product. Other power bricks may work just fine, but we cannot guarantee them.